Enjoy an evening of cocktails, classic tunes and Crème de la Crème Drag Queen entertainment; with shimmering showgirls and sultry songstress’ uniting to awe and inspire. 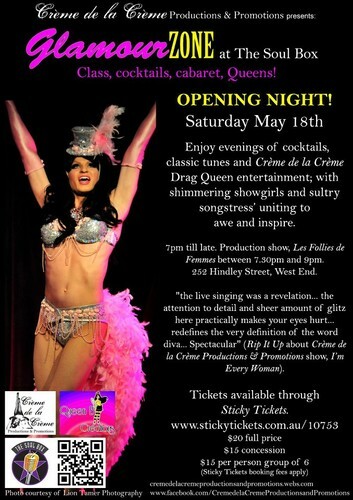 7pm till late, 'Les Follies de Femmes' production show between 7.30pm and 9pm. 252 Hindley Street, West End. redefines the very definition of the word diva... Spectacular" (Rip It Up about Crème de la Crème Productions & Promotions show, I’m Every Woman).